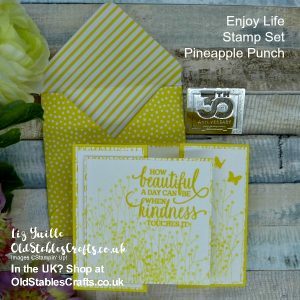 Enjoy Life in Pineapple Punch Cute Gatefold Card. There are moments when a bit of fun can become a challenge. I was watching a Facebook Live that a friend of mine did on Saturday. She made a really cute Gatefold card using the Nature’s Poem Suite. Whilst talking about the new InColors, she mentioned that she was not sure that she would like a card made with just Pineapple Punch. Now I like Pineapple Punch, I think it is a great, bright and slightly acid yellow. A colour we have been missing. I stupidly suggested whe was wrong. The measurements she used were metric, saying she could not work out how to do it in Imperial. Well that was it, I stupidly suggested that I could make the card using imperial measurements AND in just Pineapple Punch. Stop me next time! I mean, come on, I like Pineapple Punch, but one card using just that, and work out how to do the gatefold in imperial measurements! Yup, I was given the challenge – my own fault! But guess what? It worked!! I think part of the reason it worked is that the card is very small. It only measures 3-1/2″ square, so is just a small pop of brightness. Had it been much larger, I think it would be too much. There are lots of pieces, but the card itself only uses cardstock, so is fairly low on product requirements. And of course, because it is in one colour, that cuts down on the number of ink pads you need. I did add a background stamp to add some texture to the mat layers, but I am sure you could use one of the other stamps in the Enjoy Life set. I do like a good background stamp though, and was delighted to see the new Handwritten Stamp in the new catalogue. Oh, and I added a handmade envelope using the new InColor Designer Series Paper Stack; that may be a step too far. to see the original, more subtle version, hop over to Hannah’s Facebook Page. So, what do you think? Did I get away with it? Does this gatefold card work in Pineapple Punch? I would like to think it does, but I may be a little biased? Card Base – 10-1/2 x 3-1/3″. Score the long edge at 1-3/4, 3-1/2, 7 and 8-3/4″ For metric, see Hannah’s Facebook Live.